as close to my RL hairstyle as I’ve seen in SL, although it’s much better hair than mine. I also picked up Nostalgic from Illusory for when I’m feeling youthful and remembering the 80s! Wasabi Pills is also making some great mesh hair, I got Brigitte in the blonds pack and Zoey in reds. frustrations of hair going through your avatar as you move. ponytail, or wear a matching hairbase and the ponytail for a sleek look. exclusively for hair fair, and help some sick children! Find the full list of stores and SLURLS on the official Hair Fair 2012 Blog. Just a quick look of the day featuring some more lovely mesh items. The Ava dress from Ingenue has a subtle tone-on-tone floral pattern on the bodice, and an unpatterned pencil skirt. Mesh details include the pencil skirt prim, soft peplum and short sleeves. The deep V neck is still tasteful while allowing you to display a favourite necklace. The SLink Glitter Peeptoe shoes are also mesh, and with the included HUDs you can not only tint the feet, change the nail colour and resize, but also change the bow colour. I’m wearing the black, which are more of a charcoal due to the glitter, and they include a black bow as shown or a white / grey bow option. I’m very excited to be back blogging, so many pretties! Happy Shopping! Last Hair Fair Post for this year! 4 of my Hair Fair 2011 purchases! I’m running out of time, and so are you! Run to Hair Fair 2011 before it ends today! 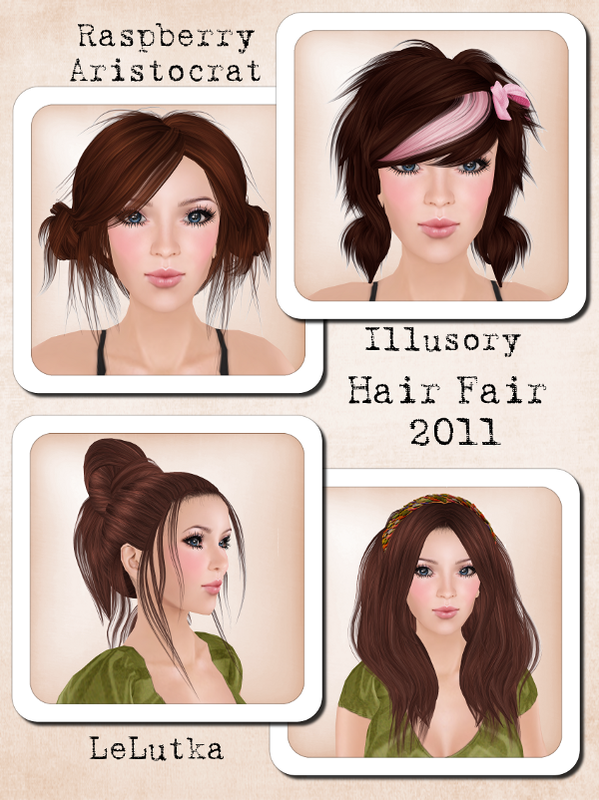 Here I’m showing Raspberry Aristocrat Khloe, Illusory’s Kimmi, and 2 from LeLutka, Knotted Hair and Shoop. Khloe is kind of like Princess Leia hair, 2 side buns with a side part and all kinds of little wisps. Kimmi is a cute little pigtails hair with a hud to change the colour of the streak and the bow. Shoop is a full long hair with a centre part and hairband. My only complaint would be that the hairband is not colour change. Knotted hair is a casual knotted updo, pulled straight back from the face and comes with a hair base to soften the edges. With lots of soft tendrils around the face so it’s not severe. Go while you still can, and remember that all Hair Fair purchases donate a percentage to Wigs for kids!